Recently there have been many concerns regarding the use rate decline of inpatient discharges. 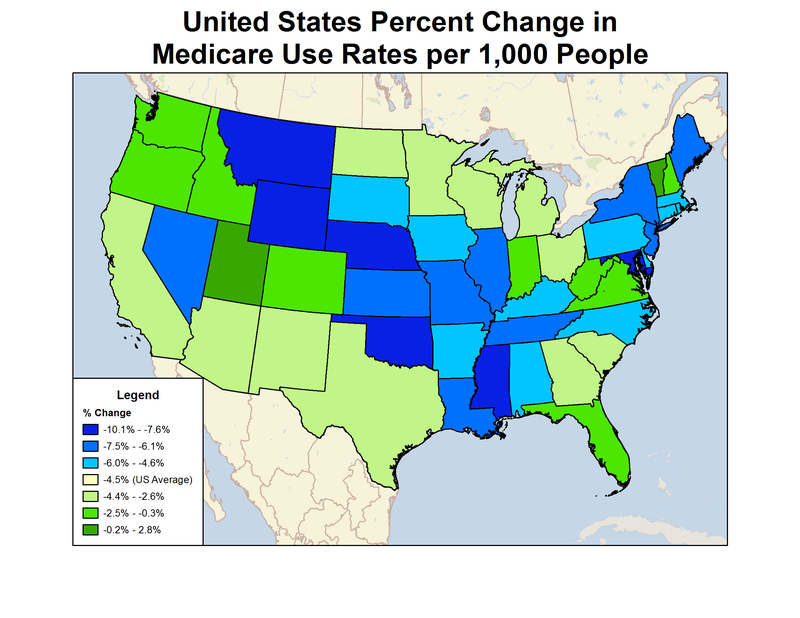 In this post we will discuss where and by how much Medicare inpatient use rates are declining across the United States. From 2010 - 2012 the use rate for Medicare inpatient discharges in the United States has declined 4.46%. The map below shows a percent change of Medicare use rates by state from 2010 - 2012. States with a use rate declining faster than the United States are blue, and states not declining as fast are green. The further a state's rate of decline is from the U.S. average, the darker the color will be on the map. Use rates in this post are calculated for Medicare inpatient discharges per thousand people ages 65 and over. The source is the Medicare Provider Analysis and Review file for 2010, 2011, and 2012. The use rate in states like Montana, Maryland, and Oklahoma is dropping at almost twice the rate of the United States. Whereas in states such as Utah, Vermont, and Idaho the use rates have remained fairly consistent over three years. The next question we would ask is "why are use rates dropping?" Is it caused by a decline in discharges or an increase in population? When we look at the United States as a whole, there was a slight increase of Medicare discharges from 2010 - 2012. But not enough to keep pace with the growth of the population over three years. We conclude that the use rate decline is not due to decreasing discharges, but to an increasing population that uses less inpatient care. But are patients avoiding care all together, or are they seeking new alternatives in the market? Stay tuned for a post analyzing outpatient visits.